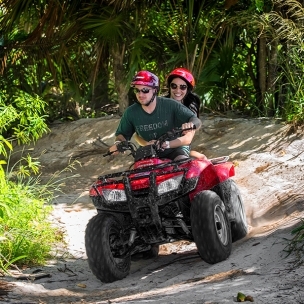 Feel the adrenaline while driving an ATV through narrow paths in the Mayan jungle and next to the white sand beach. This activity begins in Marina Maroma Adventures, located on the beautiful Playa Maroma in the Riviera Maya, considered one of the best beaches in the world. *Price per 2 people for Double ATV. (Children from 6-12 years old muts share with an adult for supervising). Tour length -45 min aprox.